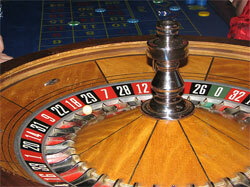 The word 'roulette' comes from French and means 'small wheel'. As most researchers claim, the roulette wheel was invented in France in 1655 by Blaise Pascal, French scientist searching for perpetual motion mechanism. It is considered to be a combination of already existing wheel and board games such as the Italian Hoca or English Ace of Hearts and "Even" and "Odd". The wheel had 36 numbered pockets and '0'. The colors on the wheel were red and black. The variety of bets we can make nowadays were already present in the game. In 1843 Francois and Luis Blanc established a casino in Homburg, Germany. They were the first to use the roulette wheel with a single '0' instead of a two-zero ('0' and '00') wheel used in other casinos before them. In 1860 Francois and Luis Blanc opened the first casinos in Monte Carlo. The legend says the two gentlemen sold their souls to the devil in exchange for the secret of the roulette game. In fact, adding the numbers on the roulette wheel makes 666 known as the devil's number. By the end of the 18th century roulette came to Louisiana with French immigrants. New Orleans had become the capital of gambling business in the US. In early 1800s the roulette spread on the whole territory of the United States, where it became extremely popular, especially in the west. In the US the single '0' roulette system was rejected and the wheels with two zeros - '0' and '00' - were used there to increase the house advantage over the players. First American roulettes had 28 numbers on the table layout, two zeros and an extra pocket with a symbol of an American Eagle. But the system was rejected as it offered too high an advantage to the casino - 12.9%- which the players could not stand any more. Now the pockets on the American wheel represent only numbers. The design of the wheel and the layout also correspond to that of the European roulette except the extra '00'. Starting from the 1970s casino roulette game has spread all over the world. The biggest gambling centers in the world are still Monte Carlo where the European single-zero wheels are used and Las Vegas in the US using the double-zero system. The American wheel is also used in South America and the Caribbean, but European single-zero system prevails all over the world. That is why one of the recommendations for the players is to play European roulette instead of American to be able to gain more profit.